Do you want to know how to check if a domain is available? So, today I will list best free and premium domain name search tools on the Internet to check the domain availability. In this post, you’ll find some domain name search tools. Many of them are instant domain name lookup tools. Which means you could get the instant result for your domain search. Another type of available domain name search tools is bulk domain name checker. Using a bulk domain name checker, you can search just more than one available domain. Without wasting your valuable time, let’s check how you can find if a domain is registered or not and how to buy a domain name at a cheap price. Godaddy is the world’s best domain name registrar. If you’re starting a website or blog online, you’d use Godaddy to purchase a domain name. It does not only because Godaddy is the home ground for millions of websites in the world, because you can buy a domain name for a cheap price. 1. Ability to filter out different types of domain names. 3. Filter available domain names as the price and length. Also, there is a Bulk Domain Search tool in the Godaddy itself. You can use that domain lookup tool to find the availability of just more than one domain name in one time. Domize is one of my favorite Domain name search tools. Personally, I use this tool to check available domain names (especially TLDs such as .com and also country specific domains such as .in, .io etc). There are some of important options and advanced settings in Domize domain checker tools. Look at this screenshot. As you can see in above two screenshots, Domize provides you awesome tools and options to look up available domain names and registered domains very easily. Also, there’s a special section for getting premium domains. If you want to buy already registered domains which have good Domain Authority, Page rank and Alexa rank, you can buy a top level domain name from the premium section of Domize Instant domain name availability tool. Instantdomainsearch.com is another very popular domain name checker tool. It does not only provide the stats about the registration of any domain name, but also does suggest related match domain names. Here’s an example. As you see, Instant Domain Search gives you auction domains. You can buy them for cheap price. Beware when choosing these types of domains. Because of some domains have good Page rank just because the webmaster has used black hat SEO methods. If you’re searching a simple and fast tool to lookup the domain name availability, so try this online tool. It’s free to use like others! Long Tail Pro is not an online service. It is a software. You can find high volume but low competitive keyword domain names which Google Keyword Planner hides from you using Long Tail Pro. It suits well for niche marketing or niche blogging. You can find good domain names which are not yet registered by someone. Download Long Tail Pro Software. Domain Hole has different domain name checker tools: An Instant Domain search tool, Bulk Domain Checker Tool and an expired domain search tool. The INSTANT AVAILABILITY CHECK tool has little domain checking options compared to other tools. However, if you want just a simple and fast tool to lookup not registered domains, check out Domain Hole instant check also. The bulk checker tool is also working as other tools. You just need to enter a few targeting keywords or your desired domain names. Then Domain Hole Bulk Domain Checker tool will do other things. Instant Name Me is another instant domain availability checking tool. The special thing this tool has is that you can preview the home page of already registered domains. Here’s an example. Instant Name me is a simple available TLD (Top Level Domain) checking tool. Click here to check it out. Domain Typer has a few tools to do a domain name search. If you want to buy a country specific domain such as .in (for India) and co.uk (for United Kindom), you can use this domain checking tool. At the bottom of the Domain Typer search result page, you can see a section called ‘Domain Hacks”. It’s very useful if you want to increase the brand awareness of your business. To find whether your country specific domain is available or not, use Domain Typer. This is one of the best ways to search best and hottest domain names. Not only expired domain names have good Page ranks, Domain authorities and quality backlinks, but also search engines will rank them higher whenever they start publishing quality articles consistently. Because they are old domains. Actually there are millions of deleted or expired domains in the internet. They are very good for search engine optimization prospects. Because you don’t need to rebuild their reputation, backlinks etc. Just take a look at this screenshot. These domains expire on 10-10-2014. Have you noticed highlighted domains’ Page Rank, External backlinks and the first found date from Archive.org? Just look at the Athusia.com domain. It has 3 Google Page Rank, 14,800 backlinks and it’s registered in 2006. You know how much time, effort you have to devote to gain those 14,000 backlinks. Here’s the Athusia.com website’s backlink profile. Actually Athusia.com has more than 14,000 external backlinks. Check this report. Actually, there are tons of expired or deleted domains like Athusia. You just need to find those domains and purchase as soon as possible. Eventually they could become your millionaire online business. Just go to expireddomains.net and put your keyword into the search box. Then find expired domains. Use SEMrush to check its backlink profile, keyword profile and other important metrics such as SEMrush traffic rank. If you have a very good domain name and you can’t control it anymore, what would you do? Yes, you would sell it. You can find thousands of quality websites/domains through Flippa. Many of these domains have good reputation. The best thing is that you can check their monthly traffic volume, monthly Adsense earning also their net profits. You know very well about Google. No need to explain about its dominance. Googlebot is a very diligent web spider. Now I will show you how to search available domains using Google search engine. Head over your browser to Google.com. Use this search query to find out whether that domain is indexed by Googlebot or not. Alternatively, you can also use Bing or Yahoo search engines. But i recommend you to use Google for find not yet registered domains, because Google crawl new websites more speedily than other search engines. The above search query will find a .com domain, if it’s already indexed by Google. Here’s what I was going to explain you. … Now look at this Google result page. Google didn’t find a domain called volleyballtraininginstitute.com in their search index. So I will go to this domain to make sure it’s not registered. Here’s what I see. Google chrome informs me that “This webpage is not available”. Which means it’s not yet registered. Not only you can find available top level domains such as .com, .net and .org, but also you can search more custom domain extensions such as .ly, .com.au, .lk, .in, .pk, .cn etc. You don’t need to go through other tools to check the domain name availability. Just using a one search query, you can find the domain name availability. The downside of using Google search engine for finding available domain names is that domain owner may block Googlebot to index the website. So that you’ll NOT see the domain name in Google SERP. Therefore you have to use another domain name search tool to check available domains. These are handy tools in BustAName which help you make a good domain which is keyword rich, branded, easy to spell and memorable. I am not going to very deep into how to find a good domain with Bustaname. However you can learn everything you want with these Video Tutorials. Bustaname is a must check Top level domain lookup tool. Don’t forget to use this tool to build a branded domain name for your next website. Choosing the right domain name for your online business is very crucial. Literally the domain name decides how much your online business will succeed and dominate the Google SERPs. Just look at Moz.com. It has the brand rather than keyword richness. 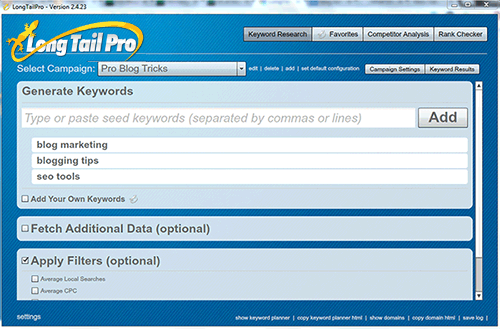 In other hand, ProBlogTricks is more keyword rich domain. If I write more tutorials about blog tricks, blogging tips, the root domain could give us a huge boost in search ranking. So make sure you make use of these Domain name search tools, and domain name checking software to craft the domain name for your next website and blog too. So what other domain search tools do you use to lookup domain name availability? Share them in the comments. I will add them to this list as soon as I received your comment. Why Should You Use a Custom Domain Name for Your Blog? yeah, it's good. It really help to me. thank! George, glad this tools helped you. Please let me know if you have any other problem to share with me. Apart of http://www.expireddomains.net/, I use http://www.registercompass.org/, they have more features although it's not free. Or I buy from vendors. I used to use http://domainswithpr.com/ but they seem to be dead now. Now http://domainsrforever.com/ seems to be a decent replacement. Great, such a great domain name searches tools. very helpful for searching a great and perfect domain name for website. selecting or finding the best domain is should be a branded one.. And interms of power and authority i believe having an expired domain is really better. Thanks for the blog. I hope this list of domain suggestion tools will be very helpful for me to find the best domain name. I am thinking to launch a new website for a new side business of web designing services. These list will make things easy for me for sure. Thanks again. Thanks for the fantastic post. The list given by you will help me to select the best domain for my upcoming websites. Thanks for providing such a great info. Thanks a ton. Great article about how to choose a right domain name for any niche. can i use longtail keyword as a domain name?